Following a reader request from Gleb received last October, BAMF Style is taking a look at the distinctive and sophisticated tuxedo that Grant wears while romancing Deborah Kerr aboard the SS Constitution in 1957’s An Affair to Remember. 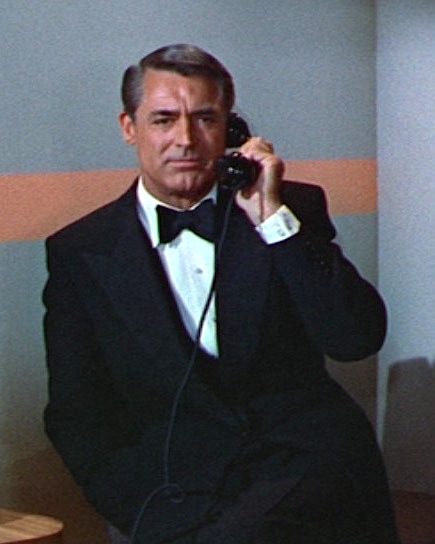 Given that the film lent its title to a number of tuxedo rental shops, it’s only fitting that An Affair to Remember would feature Cary Grant in one of his most debonair black tie ensembles. Grant’s character, Nickie Ferrante, dresses for dinner in a midnight blue worsted dinner jacket with a distinctive single-link button closure. The link-front design had fallen relatively out of vogue by World War II, mostly popular during the waning years of the Edwardian era as the dinner jacket itself was eclipsing the formal tailcoat in men’s eveningwear though it remained a natty alternative through the early decades of the 20th century. Nickie and Terry trade barbs in her stateroom. Grant’s dinner jacket has sharply pointed peak lapels with satin facings and buttonholes. The long, wide lapels extend down to the low stance of the link-button front, working in tandem with Grant’s tall 6’2″ frame to create a luxurious V shape that follows the flattering fifties cut of the dinner jacket, widest at the padded shoulders and suppressed through the waist for a strong silhouette. Grant wears a distinctive matching midnight waistcoat with a low V-shaped opening and a large single-button closure. The full back appears to be covered in midnight satin, glimpsed at certain angles when Grant shifts around in Kerr’s stateroom. The waistcoat nicely complements the low button stance of his dinner jacket. The trousers are midnight blue worsted to match the dinner jacket with a satin side stripe down each leg and side pockets – likely cut just behind those stripes – where Grant often places his hands, even when sitting. The bottoms are appropriately plain-hemmed with no cuffs. Clever framing with Grant and Kerr in the middle, flanked by the “angel on her shoulder” (her fiance’s photo) on the left and the “devil on her shoulder” (her bed, albeit a single one) on the right. The white formal shirt has a long-pointed semi-spread soft collar, a favorite of Grant’s, and a plain front where he wears two diamond studs visible above the waistcoat. The squared double (French) cuffs are fastened with a set of silver-trimmed mother-of-pearl chain-style links. The midnight blue satin silk bow tie is butterfly-shaped and, naturally, self-tied rather than adjustable or pre-tied. The chain-style links are two-sided, visible on both sides of his wrist as Cary Grant here appears to be mansplaining either elevator mechanics or appropriate serving methods to Deborah Kerr. The most appropriate shoe for black tie is the formal oxford (balmoral), and Grant here wears a pair of square-toed black leather oxfords with black silk socks. The Cary Grant fan club awaits him as he descends the deck stairs. Nickie’s wristwatch is likely the same gold Cartier tank watch that Grant preferred to wear in real life. Never call him late for dinner. For a rainy evening at the opera, Nickie Ferrante opts for practicality over formality, wearing a black waterproof raincoat with a short Prussian collar, fly front, and set-in sleeves. He leaves only the top button of his raincoat undone, revealing a white cashmere scarf tied in an ascot-style overhand knot. Once his cab pulls away, he dons a black felt homburg with a black grosgrain band. Back in New York, a little rain must fall. Nickie Ferrante glides into the lounge of the SS Constitution and at first orders a champagne cocktail before recalling his earlier conversation with Terry McKay. Nickie: Don’t you think life should be gay and bright a bubbly like champagne? Terry: I like pink champagne. Nickie: Yes, that’s the kind I mean – pink champagne. Now is there any reason why from now on, this trip shouldn’t be pink champagne? Although Terry had nixed his romantic advances by pointing to her fiance, Nickie’s spirits haven’t been soured and he amends his order to a glass of pink champagne before asking the bartender where he can pick up cigarettes. When he returns with his fresh pack of Chesterfields, Nickie is just as surprised as Terry to find that they have both been served glasses of pink champagne, placed inches away from each other on the bar. The pink champagne served in the 1950s at the time of An Affair to Remember would have typically been the sweet sparkling variety that was developed in response to drinkers who wanted an alternative to dry Brut champagnes. Since then, dry variations of rosé champagne have been developed by adding a touch of still Pinot Noir to sparkling cuvée or the less common saignée method of bleeding the clear juice after limited black grape skin contact. There are few looks as iconic as Cary Grant in a tuxedo and he looks ever bit the gentleman as Nickie Ferrante during his romantic transatlantic crossing. I’ll just take my ego for a walk. Nice Post! I really like this Ensemble! The quality of the images makes it hard to be sure, but I suspect the shirt is a Marcella weave shirt (sometimes called pique, though I believe there is some distinction I don’t understand). There is the slight suggestion of texture in the way shadow falls and the Marcella weave shirt is the appropriate for black tie than a plain shirt. An Affair to Remember is, of course, a remake of 1939’s Love Affair. The remake had more engaging stars but the original had plenty to recommend it to. Charles Boyer sports some interesting, if sometimes rather flashy, clothes in effectively the same part. His dinner jacket is a late 30s style double breasted one. More generally the thing that strikes me is that this is very like the dinner jacket combination Cary Grant wore in Notorious (1946). In fact, it is very nearly identical. The only obvious differences are in a couple of touches in the cut of and detail of the DJ: the further lowered buttoning point, the reduction of waist suppression and the link button. All of these are, of course, very 50s details – long straighter jackets with low buttoning points were very fashionable and Neo-Edwardian tailoring touches had started in the 40s and gained popularity and remained so through the 60s in English tailoring. To my eye, the 40s version has the edge: the buttoning point is still low and the waist suppression gives extra shape to the suit. Both suits have the broad shoulders that makes the wide sweeping peak lapels so dramatic. By the time this movie was made the suit worn in Notorious may well have been well over 15 years old, however. 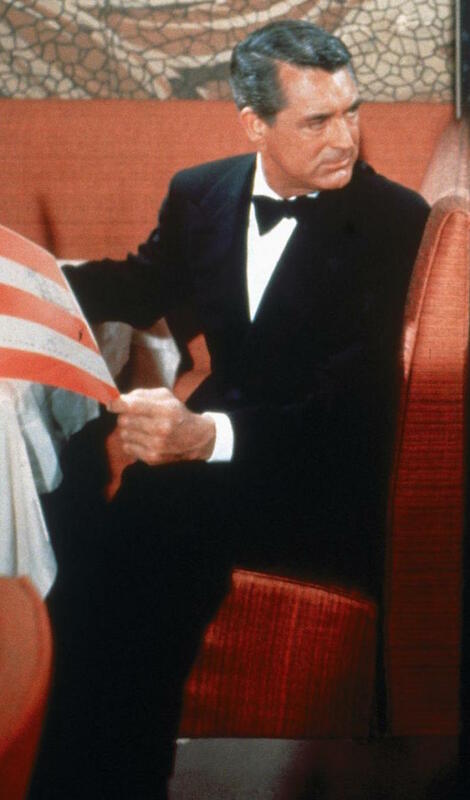 I think we can see Grant wearing it on New Years Day of 1940 for the premiere of Philadelphia Story on Getty Images. It probably felt like it needed a little updating.